Last week, we flew with a team from the government to Jimani, Barahona and Cabo Rojo to check out the condition at the main border crossing between Haiti and the Dominican Republic, and two airstrips - one of which we already use as a contingency base. In view of the amount of aid (food, shelter, sanitation equipment, medicins,...) which is moved into Haiti, the logistics aspect, one of the areas we are responsible for, is critical. While things are very busy - to say the least - at this moment, in my view, the peak of the movement of goods still has to come, at the time we are shifting from emergency response to basic reconstruction. In many aspects, for the Haiti operation, the logistics of the aid operation will determine the success of the relief efforts. For last Sunday's assessment mission, we used one of the MI-171 helicopters we have deployed in the Haiti operations. 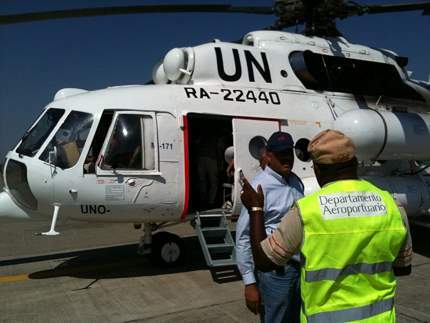 We have four helicopters, two cargo planes and two passengers planes which ferry mostly people, but also urgent or fragile cargo between the Dominican Republic and Haiti. On the way back from the mission, the pilot followed the Southern coast of the Dominican Republic, from the Haiti border up to halfway to Santo Domingo. The views were astonishing, and in sharp contrast with the devastation in Haiti.